Is there a Bigger, Better Nut Milk Bag? Yes there is. Finally!!!! We did such an awful lot of testing on Ellie’s Best Nut Milk Bags and all together it was a unanimous and across the boards, thumbs up, for those who are paleo, gluten free and otherwise. Even those in my testing group who thought they “hated” making nut milk were convinced otherwise once they tried this new to the market bag. I have to say, as someone who makes my fair share of nut milk, I have tried many different ways of going about the straining of my milks, no matter the nuts or seeds. Many recipes say to use cheesecloth and for most beginners this is the way they go about it. Ugh! Some sites even recommend using a kitchen towel! Wowie! Of course there are many bags on the market but they are either too small or they leak all over. Well, after trying this bag, and with my own daughter previously nearly swearing off the nut milk making process entirely, I think that the proper tools are what make a world of difference in the enjoyment of the process. After all the saying goes, “the right tool for the job.” For any paleo kitchen, this is a great tool. One of our testers said of the cheesecloth process, “I had to double up on it and I went through almost an entire roll of cheesecloth just to make one batch of almond milk, and even that started to break on me!” Ellie’s Best is a nut milk bag you can use many times. All of my testers commented on the size of the bag and said that it was easy to squeeze, much less mess and super smooth results with no particles passing through at all. This is key to a clean nut milk. One tester became adventurous and experimented with a spicy lemonade ginger elixir and a homemade tea-steeped pistachio-dark chocolates recipe. You can also use these bags to make your own cashew cheeze or cold brew coffee. The nut bags come with a recipe eBook with soaking times and inspiring recipes. The bag and recipes were designed by Mike and Athena Owen, owners of Ellie’s Best. Athena and Mike had been making nut milk for years and they knew that the process could be and had to be easier. They used many nut milk bags in the past but found them breaking, the mesh was not fine enough to strain properly or they were just too small. So, Athena set out to design her own nut milk bag, one they would like to use in their very own home. Many people are sure happy they did! 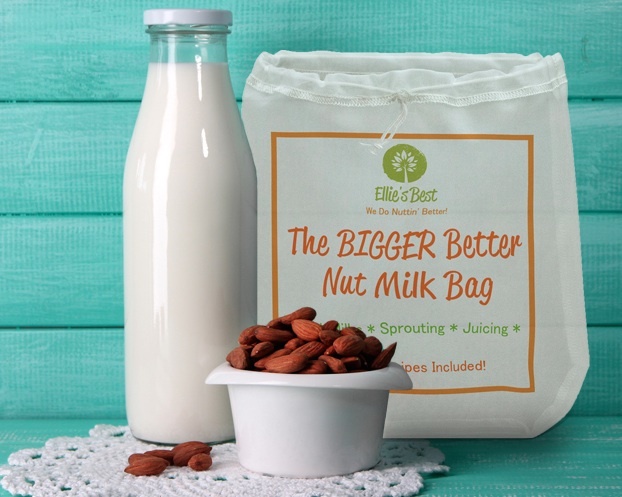 Ellie’s Best Nut Milk Bags can be found at www.ElliesBest.com and on Amazon. 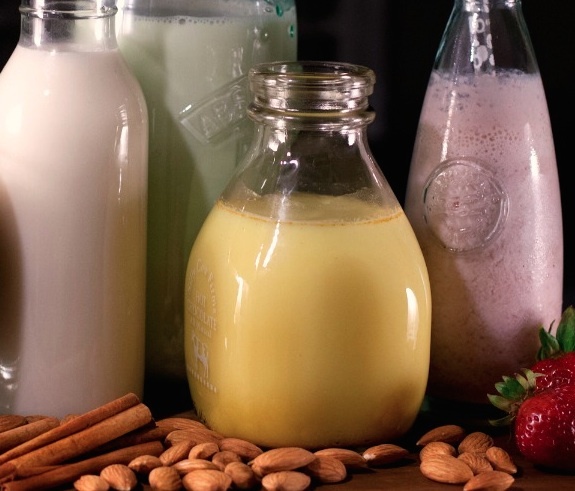 Enjoy the recipes created by some of my wonderful testers during this testing process and start making your own delicious nut milks. And for fun, pair up your nut milk with my delicious paleo blueberry pancakes recipe. 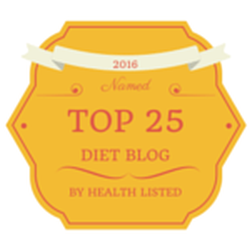 Email me to share your recipes with me. I always love to hear from and get inspired by others! As always, have fun! Oh and be sure to check out my giveaway page to win an Omazing product.